Discussion Column is intended to organize conversation in the list item without need to enable list versioning. Component allows entering rich text with formatting, images, tables, hyperlinks, etc. Actually Discussion is similar to an IM message system: many users are able to create rich-text messages, but there is no ability to modify previous messages. As IM, discussion control can show who and when has published post . 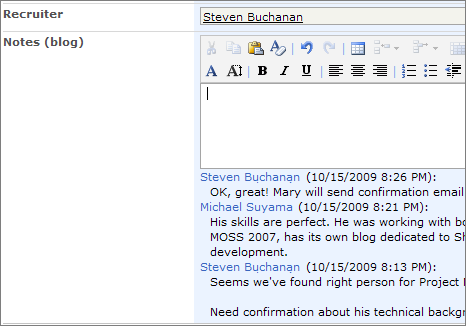 Useful thing is that it is possible to show all conversations in list view or just a hyperlink to "View Item" form. It is helpfull when discussion has many items and page becomes congested. You can also arrange your comments in chronological or reverse chronological order. User signature could be displayed on top or bottom of an entry. Qweas is providing links to ArtfulBits Discussion Column 1.54 as a courtesy, and makes no representations regarding ArtfulBits Discussion Column or any other applications or any information related thereto. Any questions, complaints or claims regarding this application ArtfulBits Discussion Column 1.54 must be directed to the appropriate software vendor. You may click the publisher link of ArtfulBits Discussion Column on the top of this page to get more details about the vendor.